On Tuesday, June 24, the Philadelphia Union will host the New York Cosmos in the fifth round of the 2014 US Open Cup. We begin a two-part series on Philadelphia’s history with past Cosmos teams from New York with a look at the “intercity championship” series between an All Philadelphia team and the New York Cosmopolitans that took place between 1891 and 1894. This being the first recognized Association football club to visit this city, considerable interest is being taken in it. Both teams will have out the strongest players and lovers of the English game may expect the best display of the season. The “English game,” association football, is of course better known today in the United States as soccer. The opportunity for a soccer game on any day other than a Saturday was rare in Philadelphia, where organized league games were almost exclusively played on Saturdays. The primary reason for this was because Pennsylvania’s blue law of 1794, a law which would remain in effect until 1934, prohibited “all sports and diversions” on Sundays. Philadelphia soccer teams at the time were amateur sides made up of British immigrants, most of whom worked in the city’s textile industry, which formed a significant part of the local economy. Soccer was then exclusively a fall-winter sport, which meant that workers would have little or no daylight to play the game during the week by the time they finished their work shift. So, with work on Saturdays for most players being likely to end around noon, Saturday afternoon was the only time of the week available for matches. The general exception to Saturday games was holidays matches, particularly on Thanksgiving and Christmas. 1891 would be the year in which holiday games would be established as a Philadelphia soccer tradition that would continue for decades. On November 23, 1891, the Inquirer reported, “The visit of the Cosmopolitans, of New York, is causing a flutter of excitement in the Association ranks.” The report noted, “The visitors have gained quite a reputation in the metropolitan football ranks, and spectators will have ample opportunity of judging of the merits of the great English game.” In addition to the excitement of witnessing the first intercity friendly in Philadelphia, fans of the game would also have been excited by the fact that the team that would face the Cosmopolitans would in effect be a Philadelphia All-Star team. As the Inquirer noted, “North End will not rely on their own team to meet the visitors, but will select players from other clubs in the Association, which will lend the game additional interest.” North End would have a pool of seven PAFU teams from which to select players; in addition to North End, these included the Frankford, Oxford, Tacony, Athletic, Enterprise, and Philadelphia teams. That “flutter of excitement” would be needed because when the two teams met on Thanksgiving on November 26, 1891, the weather was horrible: rain with a high of only 43 degrees. Nevertheless, the Inquirer reported on November 27 that “Despite the miserable weather and driving rain,” nearly 2,000 people attended the game at Forepaugh Park, which was located at Broad and Dauphin streets and, as the former home of baseball’s Philadelphia Athletics, was also known as Athletic Base Ball Park. As the Inquirer described, given the weather, playing conditions were less than ideal. While nearly every player fell in the mud there was no rough playing, the players finding it almost impossible to keep their foothold. The slippery condition of the ground caused the players to present a woe-begone appearance after the game. There is no report in the Inquirer or the New York Times of North End ever making the trip to New York for the return game and it appears that the next time a Philadelphia team played the Cosmopolitans was again in Philadelphia on Thanksgiving Day in 1893, which fell that year on November 30. Conditions were much better when the picked All-Philadelphia team hosted the Cosmopolitans at Stenton Park in Wayne Junction, a mild 53 degrees and no rain. The Inquirer match report from December 1, 1893 relates that the Philadelphia side “started off with a rush,” and “a pretty piece of combination play” saw inside left A. Colsey put the home team up 1-0. Ten minutes later, “a fast shot” saw Cosmopolitan center forward W.E. Gill equalize for the visitors. Play was open after that, as “the ball traveled up and down the field.” Ten minutes before the half, “a screw shot” from outside left J.H. George gave Philadelphia the 2-1 lead. The New York Times, December 1, 1893. Awakened from their spell of poor play, Philadelphia now “pressed their opponents hard, and but for the magnificent goal keeping of Galliant would have rolled up a large score.” The home team would get a goal back when inside right T. Mackenzie headed home a cross from center forward C.E. Sudell (the New York Times report credits outside right D. Carmichael with the goal). With time running out, The New York Times reported, “The excitement was then intense, the home players straining every nerve to score another goal.” But Philadelphia’s resurgence would come too late and soon after the goal, time was called. The New York Times, February 23, 1894. As it turned out, it was the Cosmopolitans who seemed to be giving pointers, opening the scoring after eight minutes of play through inside right W.E. Gill. But twelve minutes later, Philadelphia inside left R. Barr equalized “by kicking a very pretty goal.” Minutes later, outside left A. Colsey made it 2-1 for Philadelphia. By now, the snow covered field had been churned into slush and mud. “Desperately did the lads from New York dribble the ball back and forth” in search of an equalizer and soon they found it, courtesy once again of “the sure right boot” of Gill, “who seemed to be everywhere.” Soon after, Cosmopolitans inside left J.L. Douglas made it 3-2. Just before the half, center forward D. Carmichael leveled for Philadelphia and at the halftime whistle the scoreline stood at 3-3. The Varsity boys thought the sport rather tame at first, but after Captain Walker, of the New Yorks, was accidentally kicked in the stomach and laid out for a few minutes, “Bucky” Vail became enthusiastic and said he believed the game might come into popular favor, after all. The New York Times reported on March 24, 1894, that, after the draw, “Capt. Trenchard of Princeton and Vail, Mackey, and a host of other college experts from the University of Pennsylvania were highly pleased with it and expressed the opinion that there is a great future for the game in this country.” It would become a familiar pronouncement in the years that followed. The rematch was scheduled for March 24, 1894, again in Philadelphia at Forepaugh Park. The Inquirer reported on March 25, “the day was an ideal one for Association football. Fully 2000 persons, including many women, were present and watched the game with great interest from the stands of the old Brotherhood Park” (the New York Times reported on March 25 that 3000 people were in attendance). Among those in the stands were Harry Wright and Arthur Irwin, the ex- and present manager of the Philadelphia Phillies, as well as Phillies players players Ed Delahanty and Charlie Reilly. Five minutes after the opening whistle, Carmichael gave Philadelphia the 1-0 lead. The Inquirer reported, “This put the crowd in good humor and infused courage and activity into both elevens.” Fifteen minutes later, it was 2-0 for Philadelphia, when, after a close struggle for possession in front of the Cosmopolitan’s goal, left half back A. Couper found the back of the net. The Philadelphia Inquirer, March 25, 1894. Seconds later, Barr made it 3-0, and, the Inquirer reported, “it now looked as if an easy victory for Philadelphia would be the result.” Just before the halftime whistle, C. Sudell, now playing inside right, made it 4-0 (the New York Times report says Sudell scored just before the final whistle). 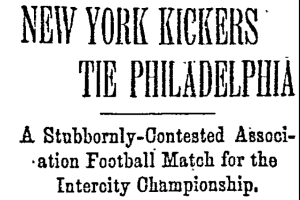 A goalless second half followed, each side “being imbued with a determination not to give the other the least advantage and Philadelphia claimed the first Philadelphia-New York intercity championship, along with the eleven gold medals that went with it. Two days after the 3-3 draw, the Inquirer reported on February 24, 1894 that Phillies manager Arthur Irwin had announced a “scheme” to launch a professional soccer league that would be backed by National League baseball teams. While the American League of Professional Football Players only lasted 18 days when it was launched in October of 1894, it nevertheless was the first professional soccer league in the US. Among those who played on Irwin’s professional Philadelphia Phillies-backed soccer team were third baseman Charlie Reilly and future Hall of Fame slugger Ed Delahanty, both of whom had been in attendance when Philadelphia defeated the Cosmopolitans 4-0 to claim the intercity championship. The Phillies goalkeeper was none other than W. Deardon, the goalkeeper for the All-Philadelphia team in the 3-3 draw and 4-0 win over the Cosmopolitans. The player-coach for the New York Giants soccer team was the Cosmopolitan’s R. Trainor, who had played center forward in 3-3 draw and outside left in Philadelphia’s 4-0 win. However, Trainor did not play when the Giants won 5-2 in the Phillies home opener at Philadelphia Base Ball Park on October 9, 1894. Clemont Beecroft, the man behind the All-Philadelphia team, launched a rival professional team in answer to Irwin’s Phillies team, and Beecroft’s squad included several players who had played against the Cosmopolitans. On November 24, 1894, Beecroft’s team played the newly formed Princeton college team at Stenton, Wayne Junction, defeating them, 7-1. By 1895, Beecroft’s team was playing as the John A. Manz team, which was backed by the treasurer of the G. Manz Brewing Company, which operated the Bavaria Brewery at 6th and Clearfield Streets. On May 22, 1897, Manz became the first team from outside of the Southern New England-Northern New Jersey axis to win the American Football Association’s American Cup, the de facto US national championship. After defeating the True Blues of Paterson, New Jersey, in the first leg 4-2 at Stenton Park on April 24, 1897, they then were the 5-2 winners in the second leg in Newark on May 22. A Philadelphia team wouldn’t win the American Cup again until 1910 when Tacony defeated Newark’s Scottish-Americans, 2-1. It does not appear that Philadelphia and the Cosmopolitans ever faced one another again. On March 4, 1894, before the deciding game at Forepaugh Park, the New York Times reported that the Cosmopolitans had invited the All-Philadelphia team for a game “to be played in this city early next month,” but I can find no record of the game taking place. 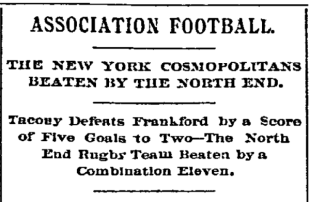 On November 29, 1894, the New York Times reported that a game between the Cosmopolitans and Philadelphia that had been scheduled to take place in Philadelphia on that day had been postponed “owing to the Philadelphia-Harvard” gridiron football game, with “The ‘Cosmos'” instead traveling to Newark for a game against “the Jefferson Club.” As far as I’m aware, that’s the first reference to a “Cosmos” team in New York. The New York pro sports franchise which came into being immediately before the Cosmos was the New York Mets and that’s how the Cosmos got their name. Mets is short for Metropolitan and I wanted something bigger and better than mere Metropolitan and, running through all the words I could come up with, came up with Cosmopolitan. Hmm. That’s about right for New York, that’s about right for soccer but Cosmopolitans? Cosmopolites? So what about shortening it to Cosmos, then? Perfect. At least, I though so. Nesuhi Ertegun, with his background in music, wanted to call us the Blues. Someone else suggested pink uniforms and hearts along with edges and calling us the New York Lovers, ensuring us of much attention, so he thought. With Pele in mind, I chose the colors of Brazil and ran a competition (two free tickets to Zurich, courtesy of Swissair) and waited for the entries to come in, discarding them all (well, amounting to fewer than 40 all told) until I came to one from two schoolteachers in Queens. Cosmos, they said, so with a genuine winner in hand, I could manufacture several other Cosmos entries and declare it the people’s choice. Well, mine anyway. Thus, the name of the NASL’s New York Cosmos was the invention of a team executive and a rigged fan vote and not a homage to a storied team from New York’s soccer history. After that last game in the intercity championship series at Forepaugh Park in 1894, the next time a Philadelphia team would face “The Cosmos” would be in 1973 when the Philadelphia Atoms joined the NASL, winning the league title in their first year. Our series concludes with a look at how the Philadelphia Atoms and Philadelphia Fury fared against the New York Cosmos in NASL play between 1973 and 1980. Ed this is magic. Great write up. I have loved the NY Cosmos my whole life but for the most part that love was ethereal. When they kicked off last season I was genuinely happy and content as soccer in this country is best served with the NY Cosmos being a part of it. I’ve written a few times in the last several months what they mean to me and with this one exception on the 25th of June, I will be happiest to watch them play. Incidentally, I sat next to Giovanni Savarese last night and was more than happy to get a photo with him and my kids. I look forward to the new stadium opening on Long Island next year. I am also pretty content they intend on remaining in NASL as it is quite easy and not disingenuous to be passionate about teams from differing leagues. Hopefully Tuesday’s game is a good one! Wow, amazing story. Phenomenal research. You know where we can get some throw back jerseys from these games?